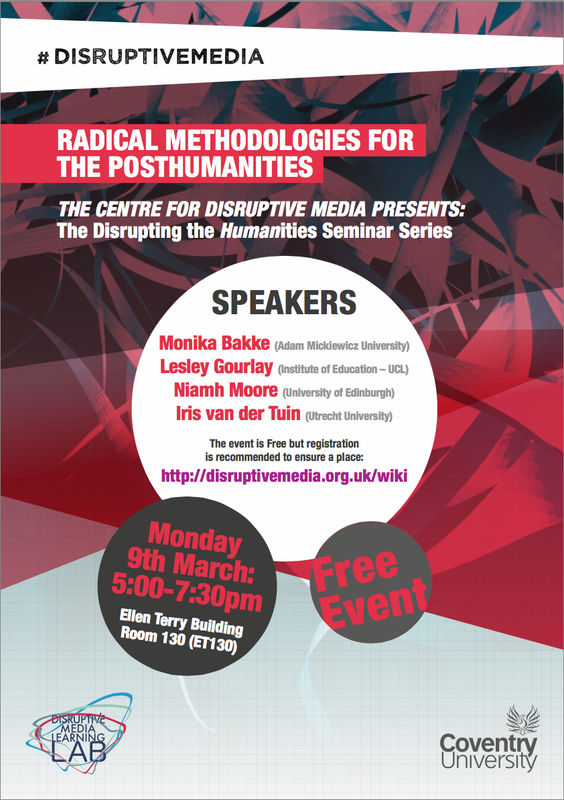 On March 9th the Centre for Disruptive Media hosted the third and final seminar in the Disrupting the humanities seminar series. This seminar was entitled ‘Radical Methodologies for the Posthumanities‘, and featured papers by Monika Bakke, Lesley Gourlay, Niamh Moore and Iris van der Tuin. The videos of the presentations and the discussions afterwards are now available. You can find them underneath or on the wiki here, as well as on a separate youtube channel here. Most of the credit for this goes to our Media Production students, in specific to Sharifah Mian, who has been heavily involved in the conceptualising, planning, recording, and editing of the videos. Some new elements of that we have introduced in these videos include working with transparent layers, ‘overlaying’ the presentations in some sense in an attempt to be less intrusive. We have also worked with incorporating short videos of the annotations instead of screenshots. Although this might mean these inserts are harder to read in real time, the thinking behind this is that we are able to insert more material in a short-time span, where viewers/readers have the opportunity to pause the recording to read the additional material should they want to do so. Human experience is not limited to living on Earth; being Earth or becoming-earth actually seems more accurate. A planetary perspective on human life vis-à-vis nonhuman forms brings to our attention not only vast spatial dimensions but also immense temporal dimensions. The latter indicate the co-evolution of organic and nonorganic forms in complexities and scales revealing the strong geological forces at work in all life. In my talk, I will analyze art works by Katie Paterson, Oliver Kellhammer and Adam Brown which investigate the materiality of life in temporal dimensions beyond those of the human. These art works stand on the crossroads of art and science, and with their own specific methods of inquiry (which is, above all, performative rather than representational), resonate with posthumanist planetary perspectives. They offer viewers (and among them posthumanist theorists, in particular) another means of engagement, through re-enactment and intervention, with tentative materialities of immense temporal dimensions. Lesley Gourlay (Institute of Education – UCL) – Posthuman texts: nonhuman actors, mediators and technologies of inscription. In the study of textual practices in higher education, there is a recognition of the processes by which social actors are enrolled in reflexive processes of meaning- making and constitution of subjectivities, via a range of semiotic resources. However, the agentive role of nonhuman objects has received less attention in this literature. Drawing on posthuman and actor-network perspectives, this paper will report on a research project investigating the day-to-day embodied textual practices of 12 adult postgraduate students over a one-year period. The analysis will focus how mobile devices, screens and print literacy artefacts were enrolled in a complex set of posthuman semiotic practices, drawing on Hayles’s (1999) notion of the embodied virtuality and Latour’s (2005) concept of nonhuman actor as mediator. I will explore the transcontextual boundary of digital / print and how objects act not only to create new assemblages, but also to enable transitions across contextual boundaries, leading to disruption of ‘commonsense’ binaries around text and author, absence and presence, digital and print, human and device. The implications of a radical challenge to the notion of singular, stable, human authorship will be explored, concluding that a posthuman reconceptualization of authorship serves to destabilise the humanist ideologies underpinning how ‘the university’ itself is conventionally understood. Niamh Moore (University of Edinburgh) – ‘Humanist’ Methods in a ‘More-than-Human’ World? This paper takes recent methodological innovations and related conceptual developments as an opportunity to reflect on the possibilities of recuperating what may be considered a ‘humanist’ method – oral history – for ‘more-than-human’ research. Oral history, often deployed in the context of subjects of social movements asserting agency and making history, may seem the paradigmatic ‘humanist method’. Many recent methodological innovations emerge out of what have variously been termed the affective turn, the emergence of posthumanism, animal studies, and the turn to nature and materiality. The paper takes as its departure point Sarah Whatmore’s careful articulation of ‘the urgent need to supplement humanist methods that rely on generating talk and text, with experimental practices that amplify other sensory, bodily and affective registers and extend the company and modality of what constitutes a research subject’ (Whatmore 2006: 606-607). Though Whatmore is not entirely dismissive of humanist methods, I ask whether it makes sense to think of methods as humanist, drawing analogies with feminist reflections on whether there is a ‘feminist method’. I suggest we reconsider oral history as a practice, and not merely a technique which generates talk and text, and reconceptualise our notions of ‘human/ist’ research subjects. I explore the possibilities of rethinking methods, such as oral history, for more-than-human research, through drawing on my own ethnographic oral history research on women’s environmental activism. Iris van der Tuin (Utrecht University) – Reading diffractive reading: were and when does diffraction happen? My contribution discusses diffractive reading and asks questions about the spatiotemporality of diffractive reading: where and when does diffraction happen in reading processes? Furthering Donna Haraway’s 1992/1997 formulations, Karen Barad practices the reading through one another of texts and/or oeuvres in her 2003 article ‘Posthumanist Performativity’. Furthermore, Barad is very clear about the distinction between classical and quantum ways of conceptualizing diffraction in Meeting the Universe Halfway (2007). In my contribution I will unravel these two ways of reading diffractive reading by discussing my own diffractive readings, published from 2011 onwards. I will attempt to come up with a very precise answer to spatiotemporality of diffractive reading, the proof of the pudding of which is work I have done on Susanne K. Langer’s 1953 Feeling and Form: A Theory of Art Developed from Philosophy in a New Key. I will discuss how this work is in and of itself diffractive.